Paul Bonine is a garden writer, lecturer, and owner of the wholesale specialty plant nursery Xera Plants, in Portland, Oregon…. Native shrubs from Down Under, grevilleas are proving to be cold hardy and adaptable to the maritime Pacific Northwest. Drought-tolerant and carefree, they provide months of color with exotic flowers that are attractive to hummingbirds and gardeners alike. Once relegated to the corners of botanical gardens in our region, more species and cultivars are poised to move from the shadows into the spotlight. Grevillea is a diverse and enormous genus, ranging from groundcovers to tall trees, that is native almost exclusively to Australia (with a few species in New Guinea). All are evergreen members of the protea family (Proteaceae), an ancient group of plants centered in the Southern Hemisphere. They have long been grown in California but have recently garnered the attention of Pacific Northwest gardeners. Experiments with a few alpine members of the genus have opened the door to a wider array of species and cultivars that expand our understanding and enjoyment of these plants. As more become available to gardeners, their charms, ease of culture, adaptability to summer drought, and extremely long flowering season are sure to propel their popularity. They offer diverse foliage textures as well as unusual flower forms—and even fragrance. And, many grevilleas are shunned by deer. Australia is a vast continent and grevilleas have evolved to fill a wide range of niches. Three hundred and forty species reside in the deserts of the outback, coastal shrub communities, the tropical north, the temperate rainforests of the southeast, and the highest mountain zones. Most are shrubs, likely an adaptation to drought and nutrient-poor soils. Such conditions also lead to an intriguing variation in leaf size and shape, from simple, entire leaves, to fine needle-like leaves, to elaborately dissected feathery leaves—all of which make grevilleas as handsome for their foliage as for their flowers. The fine coating of hair (indumentum) that covers all parts of the plant provides further protection against the harsh climate—modifying the temperature of the plant surfaces and mitigating desiccation from sun and wind. Australia’s typically poor, ancient soils have resulted in another distinct adaptation: special proteoid roots. Also known as cluster roots, these shortlived roots form large clumps just below the soil surface, able to quickly soak up moisture from erratic rains. These fine roots are also exceptionally efficient at extracting scarce nutrients. As a result, grevilleas and other members of the Proteaceae are highly sensitive to overly rich soils; high levels of phosphorous in the soil can prove particularly toxic. Most grevilleas are adapted to soils low in organic matter; too much organic matter can lead to chlorosis and, in extreme cases, death of the plants. Grevilleas thrive on well-drained soils of average to poor fertility. In our native soils, it is best to avoid all fertilizer and to limit or exclude organic amendments. Many species are amenable to clay if planted on sloping sites. Most grevilleas grown in the Northwest thrive in full sun. They are supremely adapted to drought, especially those with the smallest or narrowest leaves. Broad-leafed species seem to appreciate more water during the driest months. 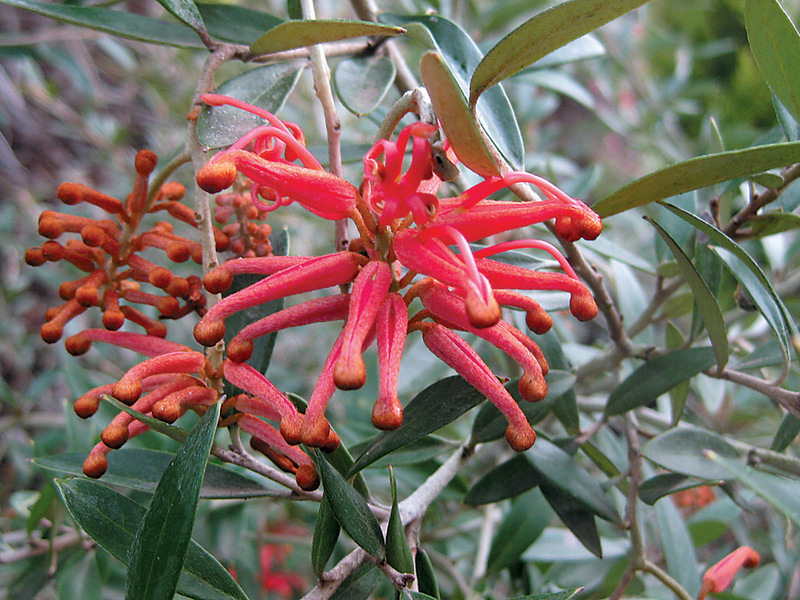 Grevillea victoriae, for instance, often begins to form its flower buds during the summer. We have noted that this species will abort buds if plants do not receive adequate moisture during the driest months; a deep soaking once a month is sufficient. Exotically shaped, vividly colored, and curiously arranged flowers are what attract most gardeners to Grevillea. Paired individual flowers are clustered into groups, or confloresences, which are usually raceme-like. Each individual flower is complex, with a strongly exserted style held above a pouch-like perianth, which will often recurve as the flower opens. The flowers offer nectar that is irresistible to hummingbirds. In their native environs, they are natural attractants for honeyeaters and other nectar-feeding birds. Most grevilleas have an extremely long season of bloom. Some will be in flower for up to nine months of the year—including the coldest and darkest winter months. It is this ability to flower through winter that has been most welcome in the Northwest. A curious trait among grevilleas adapted to cold conditions is that their flower buds are protected by a dense coat of fine hairs. If the temperature drops below approximately 26°F, open flowers will be destroyed, but the unopened flower buds will be protected and will open when temperatures rise. Hardiness to cold is the main limiting factor for the cultivation of grevilleas in the Pacific Northwest. Most of Australia enjoys a warm-temperate to tropical climate. Grevilleas found in the highest and coldest regions will have the greatest chance of success in our climates. “Cold” is a relative term, however. In Australia, the coldest conditions result from a combination of elevation and radiational cooling; there is no source of arctic air, so the ultimate low temperatures are more limited than in the Northwest. Still, at and above tree line, up to ten species thrive; even plants at lower elevations, where they may be subjected to cold air drainage in valleys, can possess significant cold hardiness. The provenance of individual plants is important: plants growing at a higher elevation will often show greater tolerance to cold than will plants of the same species from lower elevations. Therefore, it is helpful to know the precise origins of each individual plant. We have been collecting and testing grevilleas for cold tolerance at our nursery for the past ten years. A gratifying number of them have proven hardy to cold. In December 2009, we recorded the coldest temperatures since 1990. For two nights, the lows dipped to 7°F (-14°C), and to 10°F (-12°C) on the third night. This provided us with an excellent test of the cold hardiness of our plants. Of the twenty selections in the ground (we had chosen those from high elevations or known to be tolerant of cold), sixteen survived with no damage. Our site is exceptionally well drained in full sun, and none of the plants were given any protection. All had been in the ground for at least a year. Established plants typically show a much greater resistance to cold than the same species newly planted. Thus, we recommend that all grevilleas in our climate be planted in early to mid-spring to give each plant the longest possible time to establish before the first winter. Alpine or southern grevillea is a handsome, fine-textured shrub of cold, high elevations. Small, olive green leaves are clad on the back with a fine brown indumentum that also covers the stems. This lends an overall tawny appearance. This is a variable shrub, ranging from upright rounded forms (four feet tall and as wide) to ground-hugging, prostrate forms. In the alpine highlands of mainland Australia and on Tasmania (where it is the only indigenous species), it can often be seen growing against rocks that will radiate heat and protect it from severe cold. Unlike most species, this is exclusively a spring bloomer. In western Oregon, it opens its small white, flosslike flowers in March; they persist for weeks. Though not showy, these diminutive flowers emit a sweet and powerful perfume, reminiscent of honey, that carries for quite a distance in the garden. This may be the hardiest grevillea, enduring temperatures to 5°F without damage. It is adapted to fast-draining, poor soils, including bare mineral soils and sand. At our nursery, one specimen happily grows in clay soil on a slope. It is extremely tolerant of dry conditions, as well, and can thrive on little or no water in our dry summers. 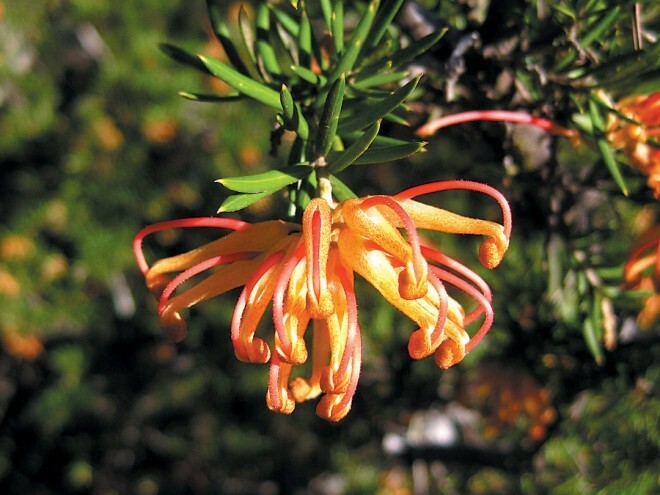 Alpine grevillea is a shrub for full sun and will not perform in shady conditions. 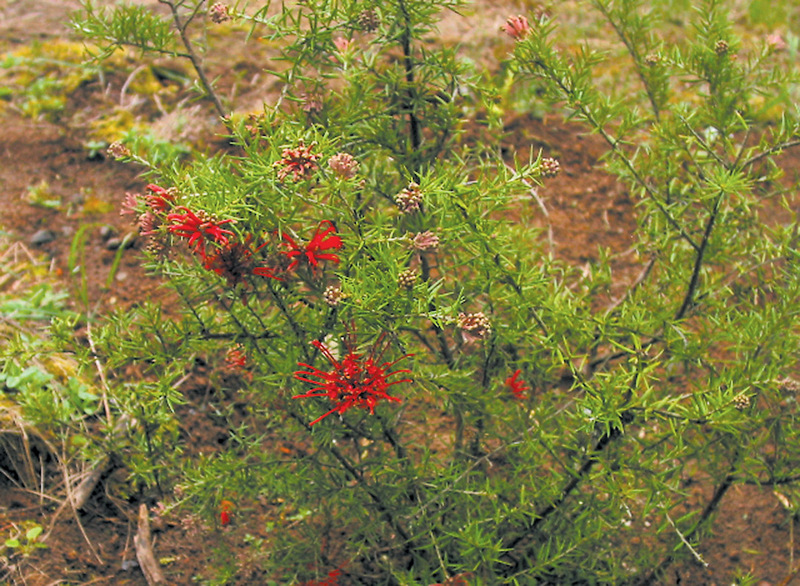 Juniper grevillea is a widely distributed shrub of middle to high elevations in Australia. It is a highly variable species, with a broad range in flower colors and growth habits. We have had great success with several forms of this tough and drought-tolerant plant. Fine, needle-like leaves are grass green and reminiscent of common juniper (Juniperus). Out of bloom, it could easily be mistaken for rosemary (Rosmarinus officinalis). One of its finest selections is ‘Low Red’, sometimes marketed as ‘Lava Cascade’. This is a spreading shrub to two feet tall and eight feet wide. In late winter, it begins a ninemonth procession of vivid, orange red, spidery flowers at the branch tips. This is an excellent low shrub for slopes and will handsomely trail over walls. It could also perform well in a large rock garden. It prefers full sun and will grow a bit straggly in shade. It has been undamaged in temperatures as low as 7°F. A spectacular selection of juniper grevillea is ‘Molonglo’, a low spreading cultivar about the same size as ‘Low Red’, but with deep green, needle- like leaves that are a bit shorter than ‘Low Red’. The true glory of ‘Molonglo’ is in the profusion of apricot yellow flowers that cover the foliage for months, beginning in early spring. In cooler weather, the flowers take on stronger apricot tones. This is a dense, weed-smothering plant that makes a handsome groundcover. Grevillea juniperina ‘Pink Lady’ has proven surprisingly hardy at our nursery. It is a slow-growing shrub to perhaps two feet tall and four feet wide, with light, creamy pink flowers that appear in spring and continue sporadically through fall. We have selected and are introducing two juniper grevillea cultivars that came from a batch of seedgrown plants. ‘Xera Ember’ produces true dark red flowers in larger-thanaverage clusters; it has finer leaves than the other selections we grow. ‘Orange Zest’ has an upright habit that results in an arching shrub to three feet tall and six feet wide. A profuse bloomer, its masses of clear orange flowers appear from late winter through fall. Both of these cultivars have endured 7°F without damage. 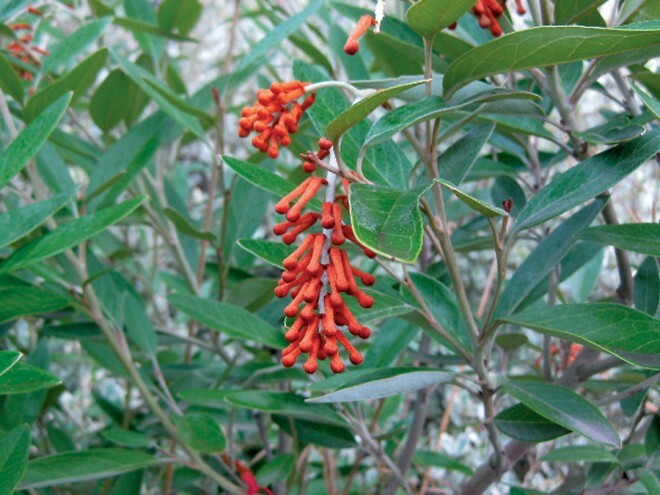 Royal grevillea is among the most regal of shrubs that we can grow in the Pacific Northwest. This tall species has large handsome gray leaves; the stems are clothed in gray as well, giving the entire shrub a soft quality. Our form of this species begins to flower in early autumn, after taking a brief break in summer, and continues through winter, with three-inch-long clusters of pendulous, vivid orange flowers that scroll open from rust-tinted buds. The effect of the flowers against the gray foliage is striking. Hummingbirds love the nectar-rich flowers. Ideal in hot sunny locations, it does appreciate occasional water during the dry months. It reaches eight feet tall and four feet wide in five years, but can be pruned to produce a smaller, denser plant if desired. 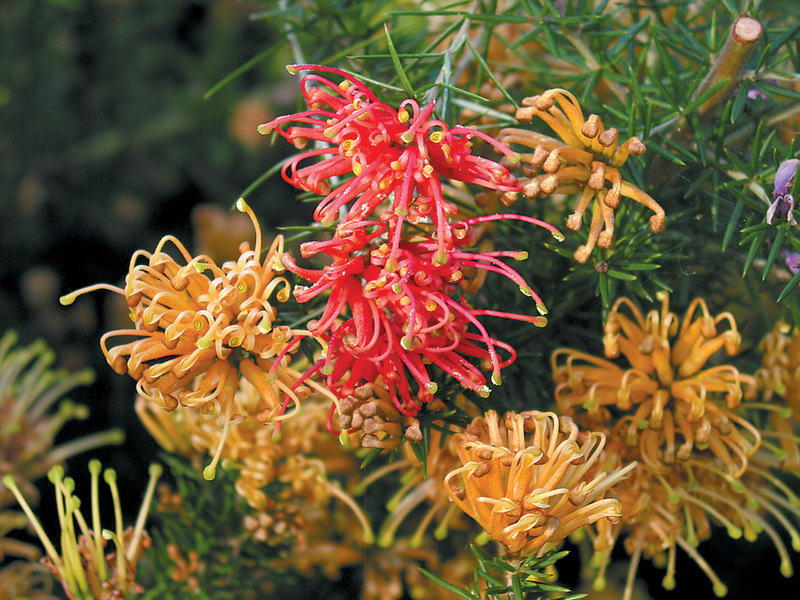 ‘Murray Queen’ is an outstanding selection of the outstanding royal grevillea. More compact than the species, its leaves have a green tint but new growth is covered in a coppercolored indumentum. This is a profuse bloomer, beginning in early autumn and continuing through spring, before taking a short break in summer. ‘Murray Queen’ grows to six feet tall and wide, with a rounded outline. Both Grevillea victoriae and ‘Murray Queen’ are hardy in USDA hardiness zone 7. Sunset grevillea would be a good name for another form of Grevillea victoriae that we obtained as G. miqueliana from the great plantsman Dan Hinkley. Its showy pendulous flowers are soft orange and yellow. It is an upright shrub with rounded, sage green, slightly undulate leaves. It reaches the same size as royal grevillea, but seems to be fussier about soil conditions than are other selections, demanding poor soil that is well drained. It has been a slow grower for us, but is as hardy as the other selections. This hybrid cultivar is one of the most commonly available in nurseries. It forms a rounded or spreading shrub to four feet tall and seven feet across, with medium green, needle-like leaves. Its most spectacular attribute is the cherry red flowers that appear in clusters more-or-less year round and are popular with hummingbirds. It is superbly adapted to dry conditions and performs well in full sun or light shade. On the mild Oregon coast (Sunset zones 5 and 17), ‘Canberra Gem’ performs stupendously with little risk of damage from cold. Further inland but west of the Cascades, it appears to be hardy to approximately 12°F and is best in a sheltered location. Soils that drain quickly encourage cold hardiness. A naturally occurring hybrid between Grevillea laurifolia and G. acanthifolia, originating in the Blue Mountains of eastern Australia, this is a spectacular groundcover shrub that offers both beautiful foliage and striking flowers. In my Portland garden, it performed well for over ten years, before being struck down by consecutive cold winters. It is hardy to approximately 10°F. Oak-like leaves emerge a dark maroon red before changing to glossy forest green. In spring through fall, toothbrush-like, red purple flowers appear at the branch tips. Grevillea xgaudichaudii remains under a foot tall but spreads up to ten feet across; it is a natural on slopes. Adapted to full sun or light shade, it prefers fast-draining soils. Challenging to propagate, it can be difficult to find in nurseries. In the Northwest, this is an excellent plant for the collector or any gardener who likes to experiment. It thrives on the Oregon coast. 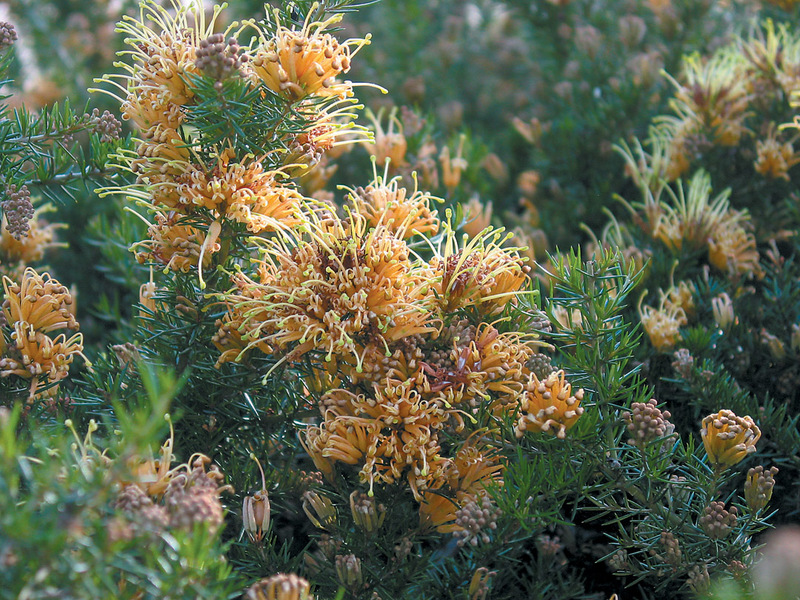 This is a large hybrid between a yellow-flowered form of Grevillea juniperina and G. victoriae. Small, olive green leaves have nearly white undersides and are held closely to the stem. It produces spidery, pendulous, apricot orange flowers nearly year round. It endures temperatures below 10°F without damage. It eventually reaches nine feet tall and ten feet wide. Similar in size and character to ‘Poorinda Queen’, this hybrid has clusters of vivid red flowers that appear at the branch tips sporadically year round. Its thin leaves are sage green. It quickly grows to six feet tall and as wide. ‘Constance’ is drought tolerant but occasional irrigation will speed its growth and establishment. It has been undamaged by temperatures as low as 7°F. This beautiful shrub, also known as ‘Marshall’s Seedling’, originated at the famous Western Hills Nursery in Occidental, California, and has been named for the nursery’s co-founder. 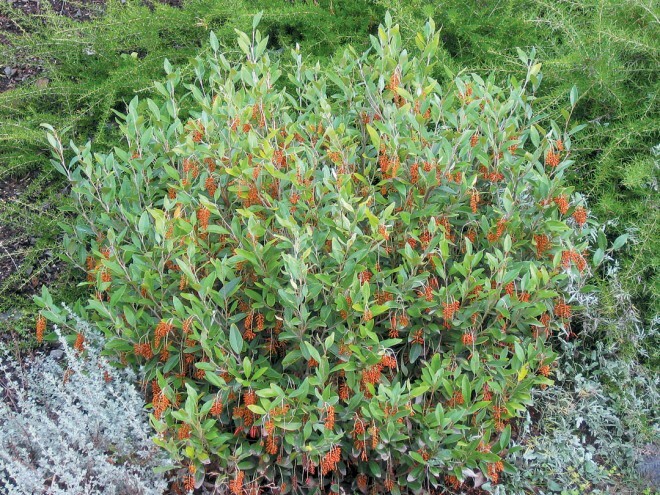 It has dapper gray leaves that are smaller than those of Grevillea victoriae (which may be a parent of this possible hybrid). Nearly year round, it produces three inch, bright orange, pendulous flowers. In my former garden, it grew to nine feet tall and wide, and was so continuously in flower that a hummingbird actually made it its home. From a distance, this is reminiscent of a small olive tree—but with orange flowers. It is fast growing and extremely tolerant of drought, although it will establish faster with irrigation. It requires full sun to perform at its peak. 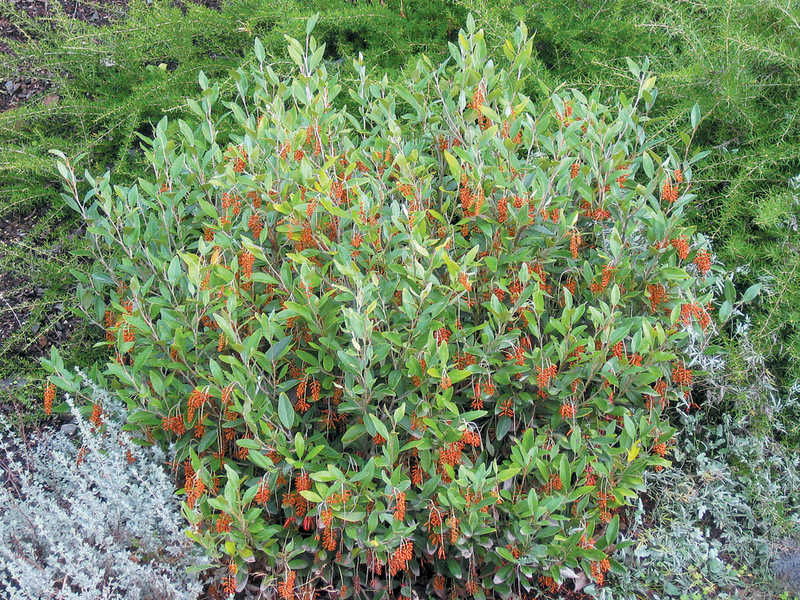 It had slight leaf burn at 7°F, but, generally, it is a tough, cold-hardy, drought-tolerant shrub. As evidenced by these examples, grevilleas offer an exotic touch for Pacific Northwest gardens. Their long flowering period and tolerance of dry summers makes them ideal high-interest shrubs for small to large gardens. An increasing number of species and cultivars are joining the ranks of those proven to be hardy and adaptable and deserve a place in our gardens. For those willing to depart from a more ordinary palette, they make wonderful specimens with a minimum of care.